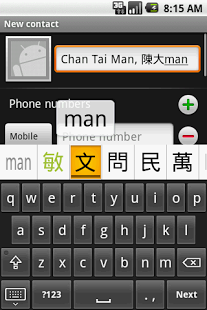 Cantonese keyboard (廣東話拼音鍵盤) is an implementation of soft keyboard for the Google Android mobile operation system. It provides an interface for the entering of traditional and simplified Chinese characters on Android devices, by means of the Hong Kong Government Cantonese Romanisation convention (香港政府粵語拼音) and English-Chinese dictionary look up. 1. If you experience extreme lag after updating, try uninstalling and re-installing the keyboard again. 2. After changing theme, try to restart the keyboard or rotate the device with the keyboard active, to make the new theme effective. 3. If you experience touch difficulty, try to set the Touch sensitivity settings as High and Neutral. 4. If you experience missing candidates, try enabling the 'Rarely used characters' option of 'Chinese candidates' setting. 5. Simplified Chinese candidates are disabled by default. Enable it at the 'Character type' option of 'Chinese candidates' setting if required. 1. 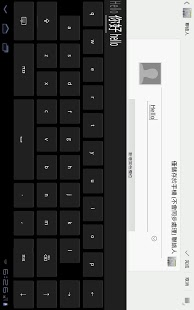 Keyboard closes itself on Contact's phone number text box of Samsung devices with Android 4.x. Will fix once we get a Samsung device on hand to check. 2. Keyboard plays sound on press on LG devices, even sound is disabled in settings. Will fix once we get a LG device on hand to check. 3. Candidates selection bar jumps when the height is set to S. Fix in the pipeline.